Mayotte and La Reunion islands are currently free of animal rabies and surveillance is performed by the French Human and Veterinary Public Health Services. However, dog rabies is still enzootic in Madagascar with 4 to 10 confirmed human cases each year. 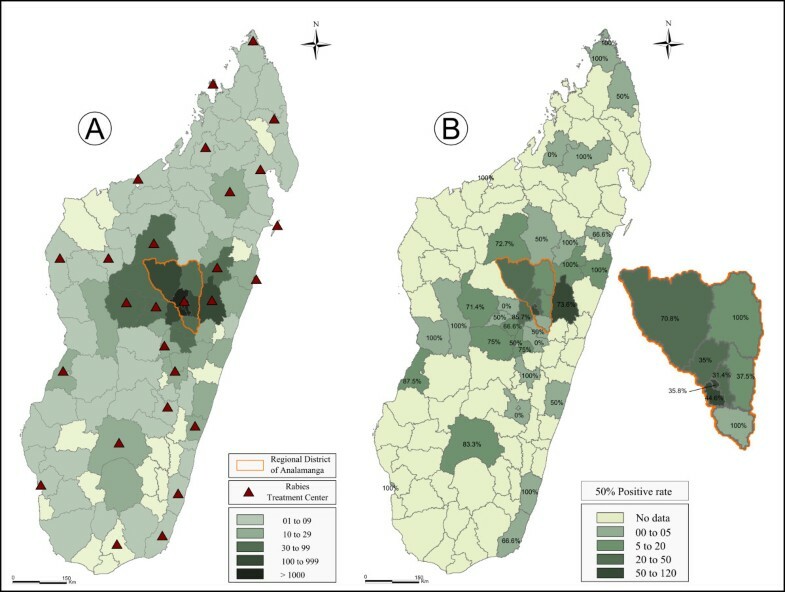 The number of antirabies medical centres in Madagascar is still scarce to provide easy access to the local population for post-exposure rabies prophylaxis. Furthermore, stray dog populations are considerable and attempts to control rabies by mass campaigns of dog vaccination have not received sufficient attention from the national health authorities. To address these challenges, an expanded program to control rabies needs to be initiated by the Malagasy authorities. Rabies is a lethal form of encephalitis. It is induced by neurotropic viruses of the genus Lyssavirus. It is a zoonotic infection mainly transmitted by the saliva of infected animals. Whereas extensive efforts in developed countries have largely controlled dog (America and Europe) and fox (Europe) rabies, dog rabies remains enzootic in many regions of the world. Rabies prevention methods have been known since the period of Louis Pasteur and have subsequently evolved to effective schedules of post-exposure prophylaxis (PEP) . About 15 million people require PEP every year. However, the estimated number of human rabies deaths remains high worldwide at approximately 55 000 deaths per year . Over 95% of these human rabies examples are concentrated in Asia and Africa, and dogs are responsible for the transmission in 99% of these cases. Control programs targeting dogs have been shown to effectively reduce the risk of rabies virus transmission to humans but their design and implementation still poses considerable challenges to governments of developing countries . The current rabies situation on islands in the western Indian Ocean is diverse. Some countries such as the Seychelles and Mauritius are considered rabies free. On the contrary, rabies is enzootic in Madagascar. This present paper describes the surveillance system of rabies currently in place in Madagascar and the collated epidemiological data for that country and two French islands, Mayotte and La Reunion, which are located close to Madagascar. In accordance to the “One Health” concept, both veterinary and human medical aspects are covered and potential improvements, when appropriate, are discussed. For human cases, written informed consent was obtained from the patient’s guardian/parent/next of kin for the publication of this report. La Reunion is an island located approximately 750 km east of Madagascar. Its total surface area is 2512 km2 with a population of about 800 000 inhabitants. Mayotte, part of the Comoros Archipelago, consists of a main island, Grande-Terre (or Mahoré), a smaller island, Petite-Terre (or Pamanzi), and several nearby islets. It is located in the northern Mozambique Channel. Its total surface area is 374 km2 with an estimated population of 194 000. Administratively, La Reunion and Mayotte are two overseas departments of France. In France, rabies is a “notifiable disease”, which means that by law one must report rabies cases to the governmental authorities when diagnosed. The epidemiological surveillance of rabies in animals and humans is performed by the Ministry of Agriculture and by the Ministry of Health and by their respective agencies, the Institut de Veille Sanitaire  and the Agence Nationale de Sécurité Sanitaire de l'Alimentation, de l'Environnement et du Travail . The primary health-care management of patients seeking PEP is delivered through an official national network of Antirabies Medical Centres (ARMC), that are distributed throughout the country [6, 7]. One of these centres is located in Saint Denis on La Reunion. No ARMC exists on Mayotte and patients seeking PEP are obliged to go to Saint Denis or vaccines have to be air-shipped to Mayotte. PEP is predominantly administered according to the Zagreb schedule . Clinicians conduct a risk assessment for each exposed patient, and decide to administer PEP according to the general recommendations, epidemiological data and nature of the bite. The French network for rabies prophylaxis provides exhaustive national data collected by ARMC and analyzed by the National Reference Centre for Rabies, (NRCR) . Rabies diagnosis in humans is based on specimens collected intra-vitam (mainly saliva and skin biopsy) and specimens collected post-mortem (skin and brain biopsies). These samples are analysed by RT-hnPCR . Terminal brain biopsies are analysed by the fluorescent antibody test (FAT) and by the rapid tissue culture isolation test (RTCIT). Both techniques are recommended by WHO. French veterinary authorities are in charge of the surveillance of animal rabies. Each animal responsible for human exposure is confined under veterinary surveillance. In cases when the animal dies or for some other reasons, diagnostic laboratory tests are conducted at the NRCR, Institut Pasteur, Paris, France, where rabies diagnosis in animals is based on the FAT and RTCIT techniques . Both Mayotte and La Reunion are considered free of rabies in non-flying animals according to the criteria of the World Organization for Animal Health (OIE). The surveillance of rabies on these islands continues today. From 2006 to 2011, one animal sample from Mayotte and 16 from La Reunion were submitted to the NRCR for rabies diagnosis (Table 1). All of them tested negative. The last human case reported in these departments was in 1996 on La Reunion. The patient was a three-year-old boy living in La Reunion. He was bitten by a suspected dog during his holidays in Madagascar and did not receive any PEP. * = (Cryptoprocta ferox (Order Carnivore, family Eupleridae). Madagascar, located in the southwestern Indian Ocean and about 400 km to the east of the African coast, is the fourth largest island in the world. The country is subdivided into 22 administrative areas, 111 districts and 2800 municipalities. In 2009, the human population was approximately 20.6 million inhabitants. Madagascar is one of the poorest countries in the world with a health system that is hardly efficient to monitor and prevent disease outbreaks, and the medical monitoring system is largely based on districts. The medical personal/population ratio approaches a satisfactory situation in urban areas, but the rural areas remain notably underprivileged. The health sector is co-funded by the government (32%), donors (36%) and private sector (32%). The provision of health services is coordinated by the Secrétaire Général de la Santé, who is assisted by the Directeur Général de la Santé. They both operate under the Département des Urgences et de la Lutte Contre les Maladies Négligées (DULMN) and the Direction de la Veille Sanitaire et de la Surveillance épidémiologique (DVSSE). The DULMN and DVSSE coordinate all activities related to disease surveillance and response. Since 1996 and in accordance with a WHO resolution known as AFR/RC43/R7, the Integrated Diseases Surveillance and Response (IDSR) system is operational on Madagascar and human rabies is one of the main diseases under surveillance. The rabies virus has circulated in Madagascar at least since the 19th century. The first reported death from rabies occurred in 1896 and two years later the Institut Pasteur de Madagascar (IPM) was established. The first rabies post-exposure treatment using rabies vaccine was implemented in 1902. Since that period, several reports have described different aspects of rabies on the island [11–15]. The last one, covering the period from 1982 to 2010, indicated that rabies was prevalent in five provinces and that dogs were the primary vector of the virus [14, 15]. Since 1963, several law texts were signed by national authorities to address measures to fight rabies  (Ministère de l'Agriculture de l'Elevage et de la Pêche: Arrêté N°3482/99 du 12 avril 1999 fixant les mesures de lutte contre la rage, unpublished; Ministère de l'Agriculture de l'Elevage et de la Pêche: Arrêté N°3483/99 du 12 avril 1999 relatif à l’observation des animaux mordeurs, unpublished) or to regulate feral dogs ). In 1978, another text was signed for the creation of an inter-ministerial committee against rabies (Ministère de l'Agriculture de l'Elevage et de la Pêche: Arrêté N°3894/78/PM du 24 aout 1978 portant création d’un comité interministériel de lutte contre la rage, unpublished). Despite the existence of these official texts, their application, both in urban and rural areas, is frequently not effective. No formal coordination exists between the Ministry of Public Health and the Veterinary Services. In Madagascar, there is only one authorised national laboratory for the diagnosis of rabies (NRL), which is located at the IPM. Animal specimens are transmitted by veterinarians, animal health officers, animal owners or exposed individuals. Further, hospital staffs send specimens collected from humans suspected to have died from rabies to the IPM. Rabies surveillance, and notification, was a national program initiated and approved by the ministries of health and Ethics committee of Madagascar (FWA00016900). Before taking each specimen, physicians explained the purpose of the notification. Patients’ relatives were then free to refuse sample collection. At the IPM, rabies diagnosis is routinely performed by rabies antigen detection using FAT, which is generally performed in a post-mortem manner on brain tissue of suspected animals or humans. To confirm negative results obtained by FAT in animal samples suspected for rabies, rabies virus isolation is performed systematically in cell culture (murine neuroblastoma cell line). Human cases are post-mortem diagnosed using skin biopsies taken from the nape of the neck. Detection of rabies virus RNA is performed using RT-hn PCR . For epidemiological surveys, specimens are also collected from bats. The presence of lyssavirus RNA was investigated by RT-hn PCR [9, 18]. In parallel, virus neutralisation assay is used to detect antibodies against different species of lyssavirus. To extend the potential spectrum of detection of this survey and to search for the circulation of any presently uncharacterised lyssaviruses, neutralisation assays were performed using in parallel 6 different species of lyssaviruses: rabies virus (RABV), Lagos Bat virus (LBV), European Bat Lyssavirus type 1 (EBLV-1) and 2 (EBLV-2), Mokola virus and Australian Bat Lyssavirus . Until March 2006, the ARMC at the IPM used Nerve-Tissue-derived Vaccine (NTV) produced by the Institut Pasteur in Alger (Algeria). During this period, this low-cost vaccine could be sent on demand to all health centres in the different health districts (n = 111). The notably more expensive Purified Vero Cells Rabies Vaccine (PVRV), the only one in use in Madagascar since 2006, could not be provided to all health centres for economic reasons. Subsequently, the total number of ARMC that could perform PEP was reduced to 27 (Figure 1a). Each ARMC is the unique source for PEP in the corresponding administrative region. PVRV is provided by IPM but each ARMC controls its own vaccine stock. PEP is provided free of charge and administered by the use of the modified Red-Thai Cross protocol (i.e. 2 intradermal injections of 0.1 mL at two sites, deltoid and thigh, on days 0, 3, 7 and 28) [1, 20]. In case of severe exposure, purified rabies immune globulins (RIG) (Equirab®, Bharat serums and Vaccines Limited) are administered to the patients. RIG are only delivered by the ARMC at the IPM and are given free of charge. PEP is discontinued in case the suspected animal is found negative via laboratory diagnosis or when it is still alive after a 10-day observation period starting from the date of the bite (or the exposure) . PEP and rabies positive animal samples in Madagascar. (A) Geographical origin of patients receiving PEP at the antirabies medical centre (ARMC) of the Institut Pasteur de Madagascar (IPM) in Antananarivo (2006–2011). Green gradient colour represents the number of bite cases that consult at IPM from different districts. Red triangles represent the ARMC located in each administrative region of Madagascar. (B) Geographical distribution of samples received at the National Laboratory Reference for rabies diagnostic. Madagascar, 2006–2011. Between 2006 and 2011, NRL received 470 animal specimens and 231 (49.1%) tested positive (Table 1). The majority of specimens originated from the urban area surrounding the capital, Antananarivo (Figure 1b). Dogs represented more than 75% of specimens. Among the positive specimens, 195 (78%) were from dogs. PEP was administered to patients for 89 animal bites that were confirmed positive and for the remaining (30 cases), PEP was not initiated. Rabies circulation has been documented in 38 of the 111 districts (Figure 1b). As part of the research program at the IPM, detection of lyssavirus was investigated in insectivorous and frugivorous bats, including two areas close to Antananarivo. No lyssavirus RNA was detected in the different individuals tested. However, 18 Malagasy fruit bats were tested positive for the detection of antibodies against LBV (12 Eidolon dupreanum) or against both EBLV-1 and LBV (five E. dupreanum and one Pteropus rufus) (Figure 2) . These results are in favour of the circulation of some lyssaviruses antigenically related to EBLV-1 and/or LBV in Malagasy fruit bats of the family Pteropodidae. 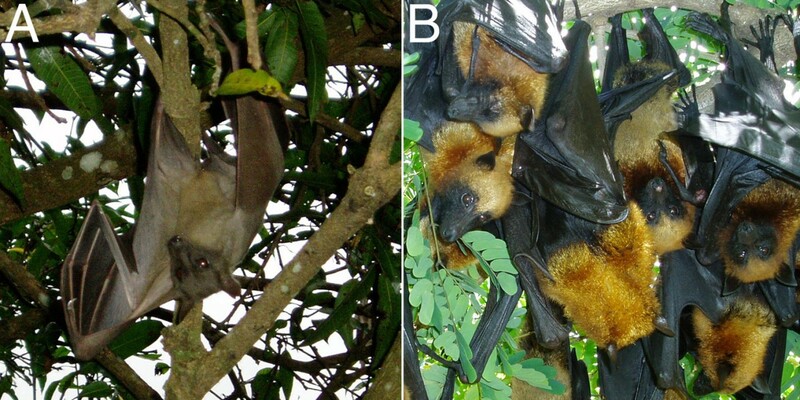 Bat species showing serological evidence of the circulation of lyssaviruses in Madagascar: (A) Eidolon dupreanum and (B) Pteropus rufus. Eidolon dupreanum and Pteropus rufus (or Madagascar fruit bats) are species of megabats in the Pteropodidae family and are endemic to Madagascar. Over the course of the past six years, 22 human specimens were received at the NRL and 20 tested positive. During 2011, NRL received 11 specimens, all positives, and seven of which were from Toamasina District on the east coast. None of these patients received PEP with the exception of one who started PEP late, 10 days after the suspected bite. Besides these confirmed laboratory cases, from different data sources, 10 clinically suspected cases of rabies in humans were reported in 2011 without further confirmation. Cultural barriers and lack of information available for local people are among the main problems explaining the low rate of laboratory confirmation of human cases. This highlights the significant under-reporting of human rabies on the island. Since the use of PVRV in mid-March 2006 until 31 December 2011, 24 946 patients visited the ARMC at the IPM, of which 97.2% (n = 24 299) received PEP. Males represented 54.3% (n = 13 556) of the cases and ranged in age from one to 97 years (median = 18 years). Children under 15 years old represented 40.5% (n = 10 107) of the consultants. The number of consultations showed little fluctuation over the past five years, with a mean incidence rate of three per 1000 inhabitants (Figure 3), with the exception of 2011, when an increase (49.3%) in the number of consultations was recorded. This growth can be explained partly by a rising number of post-exposure treatments associated with an information campaign of governmental authorities for people in contact with dogs that have tested positive in a laboratory context. The rabies day celebrated in 2011 in Madagascar resulted in an increase in the number of consultations. A large proportion of the patients (28.1%) did not complete their PEP regime. Dogs were responsible for 91.3% (n = 22 770) of the bite cases. Among the patients receiving PEP, 65% were bitten by domestic dogs for which surveillance was effective and completed in only 61% of the cases. Stray dogs bit a significant proportion of the patients (n = 6552 (28.7%)). Pattern of consultations at antirabies medical centre (ARMC) – Institut Pasteur de Madagascar (IPM), Antananarivo, 2006 –2011. 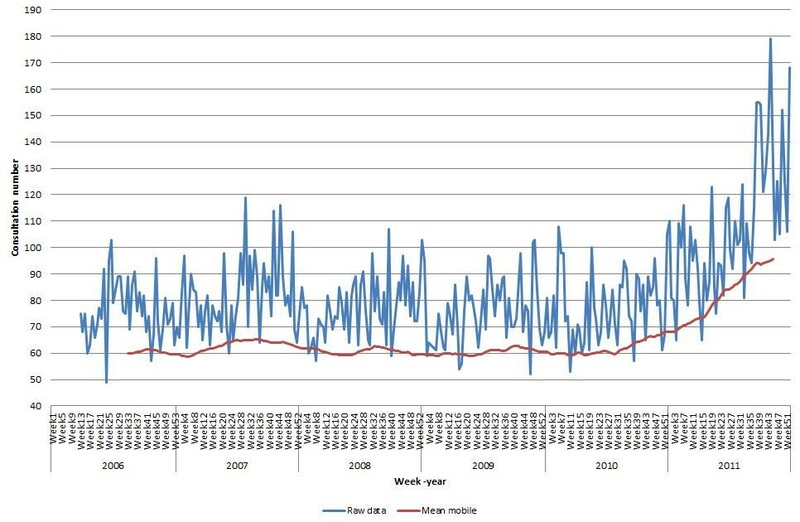 Mean of weekly visit counts at ARMC (IPM) for 5 years. Weekly visit time series plots (number) (blue-curve) and the moving average (red-curve) for weekly visit counts. The ARMC of the IPM is responsible for animal bite cases from the Analamanga Region, as well as handling cases coming from other areas of Madagascar (Figure 1a). Data are not available from the other ARMC. Nevertheless, considering the number of vials sent to the different ARMC (59 401) and given that three vials are used per patient on average, if all were administered, this would be equivalent to the treatment of about 19 800 patients per year. The partial nucleoprotein gene (502 nucleotides) of a subset of selected isolates of dead-end host (cattle, pigs and humans) was sequenced and compared with viruses isolated from dogs during different periods and from different areas [21–23] (Table 2). Phylogenetic analyses of the different viruses (n = 27) showed that all isolates belong to the RABV species (Figure 4) and to a subset of the cosmopolitan lineage named “Africa 1”, largely distributed in Africa [22, 24]. Their phylogenetic origin is quite different from the viruses circulating in countries of Africa bordering the eastern part of the Mozambique Channel (Tanzania, Mozambique and South Africa) [25–29] as such, excluding a recent importation of rabies from these countries to Madagascar. The most probable hypothesis is an introduction of rabies to Madagascar during the colonisation period as observed in other former French colonies in Africa [23, 24]. The topology of the tree and the bootstrap values also show some geographical clustering. Although this needs to be further confirmed with a larger number of isolates and with longer sequences, three virus clusters are identified in three different geographical areas: the north (isolate 6507MAD), southwest (isolates 86006MAD, 3641MAD, 10228MAD) and the centre and the west coast (isolates 10515MAD, 4602MAD, 3085MAD, 730MAD, 811MAD, 1558MAD, 114MAD, 1054MAD, 07057MAD, 913MAD, 1097MAD, 1759MAD, 4033MAD, 98003MAD, 98006MAD, 92047MAD, 92048MAD, 86007MAD, 86008MAD, 86009MAD, 86047MAD, 86048MAD, 8604MAD9). The viruses circulating in the north and on the west coast are also found in Antananarivo. This diversity probably reflects translocation of infected animals between the capital city (1.6 million inhabitants) and the countryside. This transportation probably occurs along the roads due to human intervention as reported in North Africa . 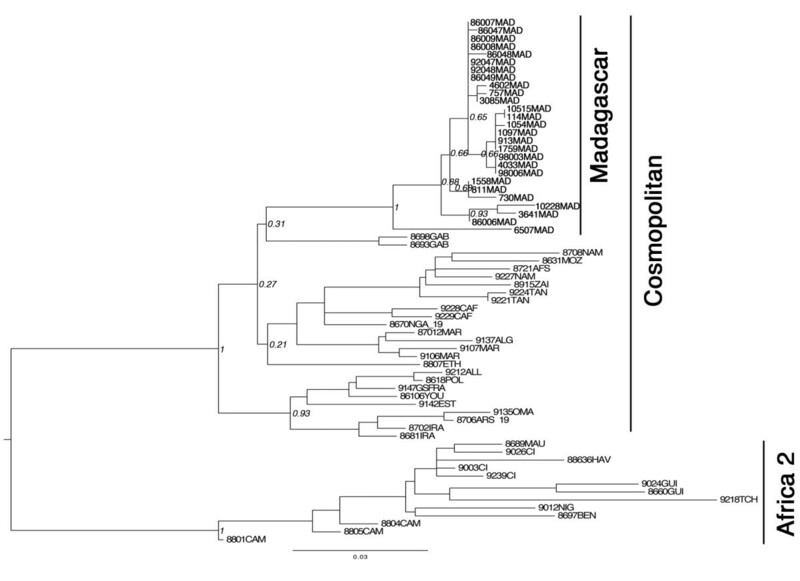 Maximum- likelihood phylogenetic tree of 66 partial N gene sequences (Positions 127–629 nucleotides of the rabies virus genome []) showing phylogenetic relationships of Malagasy isolates with other isolates originating from Africa. The phylogenetic trees was estimated using a maximum-likelihood (ML) method under the general time-reversible (GTR) model of nucleotide substitution, with the rate of each substitution type estimated from the data using PHYML 3.0 . The ML base frequencies were also estimated from the data, as were the proportion of invariable sites (I) and a gamma distribution of rate variation among sites (Γ) with four rate categories. Tree topology was estimated using the best estimates among simultaneous Nearest Neighbour Interchanges and the approach relying on subtree pruning and regrafting. The support of the data for each internal branch of the phylogeny was estimated using non-parametric bootstrap. Bootstrap support of nodes discussed in the text is indicated. The tree is rooted between the Africa 2 and the Cosmopolitan lineages. The generated sequences have been deposited in GenBank under accession numbers KC787050 to KC787074, DQ420623 and U22854. * = Associated with the bite of a tenrec ecaudatus (Order Afrosorocida, family Tenrecidae). Since no lyssavirus has been isolated on the island from bats, little can be mentioned about local diversity, and the epidemiological aspects mentioned above for the seropositive results observed in Malagasy fruit bats. There is no available census of the number of dogs living in Madagascar. The only recent data available concerns a study in Antananarivo. This work indicated that dogs are abundant in the capital as compared to other major cities on the island, less than 10% of the animals are vaccinated against rabies, and more than 10% of the estimated 500 000 are strays . No information is available on the movements of these dogs, population dynamics or on the introduction of animals from different populations. Fourty-five species of bats are known from Madagascar, of which 76% are endemic to the island [33–36]. Amongst these, 42 are insectivorous and three frugivorous. A number of species can be found roosting in human-occupied or abandoned buildings, including hospitals and schools. Presumably, these animals have a greater chance of being in contact with humans than those living exclusively in the wild. In certain cases, roost sites can be occupied by many hundreds of bats and include those of the family Molossidae (principally Chaerephon atsinanana (formerly C. pumilus or Tadarida pumila), C. leucogaster, Mops leucostigma, M. midas, Mormopterus jugularis) and the family Vespertilionidae (Neoromicia matroka (formerly Eptesicus matroka) and Pipistrellus raceyi). Little data are available on the fidelity of individual bats to a given roost site, but based on phylogeographic studies of members of the family Molossidae, certain species show considerable dispersal capacity [37, 38]. The epidemiology and mode of transmission of the suspected bat lyssavirus responsible for the positive serologic reaction in Eidolon dupreanum and Pteropus rufus (Figure 2) remains unknown and should be a focus of research. Both of these bats feed exclusively on fruit, pollen and nectar and live in colonies; the former making its day roost sites in caves and rock crevasses and the latter suspended from trees. These two species, along with the third species of fruit bat found on Madagascar, Rousettus madagascariensis, can be found at night feeding in the same fruit trees. People visiting these trees and feeding on the fruits risk the possibility of coming in contact with fruit bat saliva. Mayotte and La Reunion are free of animal rabies. However, dog rabies is still enzootic in Madagascar. Serological evidence also suggests that other species of lyssaviruses may circulate in at least two Malagasy fruit bat species. The advancement of programs to monitor rabies in Madagascar suffers from a lack of public education and a poorly functional and inefficient system for routine diagnosis of suspected cases (animal or human). The number and the origin of samples received at the NRL are insufficient to address different aspects of the disease in Madagascar (i.e. prevalence in animals, systematic sampling of suspected human cases, etc.). Access to PEP for people living in some rural areas is limited and numerous other cities and villages are requesting for the establishment of a local ARMC. Nevertheless, without more accurate information on the local epidemiology of the virus, as well as for economic reasons (cost of vaccine, need to maintain refrigeration, etc. ), the expansion of the ARMC network remains difficult. Previous campaigns to reduce stray dog populations were ineffective for different reasons. This method is costly for a country like Madagascar. Stray dogs are increasing in number due to the expanding food sources (e.g., sites with accessible trash, open slaughterhouses) and for cultural reason (no contraceptive measures for owned pets, expanding interest in dogs as house pets, etc.). To address these challenges, an expanded program to control rabies needs to be initiated by national authorities and advocacy programs should be initiated with the different stakeholders. The chance of being able to control rabies on Madagascar is high, as it is an island, and the elimination of rabies and its sustainability need to coincide with limiting the introduction of rabid animals from neighbouring enzootic countries. Therefore, an eradication program needs to be first promoted at a pilot scale, in order to test and validate the tools used for canine vaccination and population management, education and information to the general population and public health professionals. If successful, it can then be extended to an island-wide scale. We would like to thank Dr William Rakotomalala for sharing a database of patients and for his dedicated work regarding treatment. We also thank Girard Marcellin Razafitrimo, Josette Razainirina and Jean-Théophile Rafisandratantsoa for technical support on rabies diagnosis. We thank Florian Girond for geographical map. SFA: wrote the paper, carried out statistical analysis. JMH: wrote the paper and coordinate rabies surveillance in Madagascar. RR: compiled all human cases data. MR: compiled and analysed dog data ecology. JHR: helped to draft the paper. LD: carried out molecular and phylogenetic analyses of rabies strains. AL: carried out molecular and phylogenetic analyses of rabies strains. SMG: helped to draft the paper and carried out bat studies. JMR: helped to draft the paper and carried out all bat studies. HB: wrote and coordinate the paper and compiled all data from La Reunion, Mayotte and Madagascar. All authors read and approved the final manuscript.